ANGELES NATIONAL FOREST >> Homicide detectives are investigating the death of a person whose body was discovered deep in the Angeles National Forest on Sunday afternoon. Little information was initially released regarding the investigation, which began just after 12:50 p.m. with the discovery of a body in the forest along mile marker 21.08 of Angeles Forest Highway, just north of Big Tujunga Canyon Road, Deputy Juanita Navarro-Suarez of the Los Angeles County Sheriff’s Department’s Information Bureau said in a written statement. The body was initially described only as male. No age estimate was available. The circumstances of the death remained unclear. Anyone with information can reach the sheriff’s Homicide Bureau at 323-890-5500. Tips may also be submitted anonymously to L.A. Regional Crime Stoppers at 800-222-8477. PASADENA >> Police are seeking a man who they say attacked a bakery worker and threatened him with a knife after becoming jealous when his girlfriend, who also works at the bakery, hugged the co-worker on Saturday afternoon. The incident unfolded shortly before 3 p.m. at the Corner Bakery, at Lake Avenue and Del Mar Boulevard, Pasadena police Lt. John Mercado said. A man in his 20s arrived at the bakery to begin his shift at work just prior to the alleged attack, the lieutenant said. As he was walking into the restaurant, the worker briefly talked with and hugged a female co-worker who was ending her shift. The female co-worker’s boyfriend was outside the bakery and became enraged, Mercado said. The jealous boyfriend punched the victim in the face, then threatened him with a pocket knife before the store manager intervened. Both the attacker and his girlfriend drove away together. Mercado said the victim suffered a cut and swelling to his lip, but was not seriously hurt. Police were still seeking the suspect Sunday. He was described as a Latino man in his 20s, about 5 feet 10 inches tall, 175 pounds, wearing a black T-shirt and black basketball shorts. He was armed with a pocket knife with a 3-inch-long blade. Anyone with information can reach Pasadena police at 626-744-4241. Tips may also be submitted anonymously to L.A. Regional Crime Stoppers at 800-222-8477. PASADENA >> Federal authorities on Sunday released a list of 57 guns, value at more than $50,000, seized by Bureau of Alcohol, Tobacco, Firearms and Explosives agents from the Sierra Madre home of a Pasadena police lieutenant in February. ATF and Pasadena police have released little information about the ongoing investigation, during which the lieutenant has been placed on administrative leave. ATF agents were seen seizing numerous gun cases from the lieutenant’s home during the Feb. 16 raid, however no arrests have been made, and no details of the investigation made public. But the U.S. Department of Justice posted a list Sunday of the weapons seized during the search Sunday as part of a national listing of property targeted by federal officials for forfeiture. According to the document, the arsenal seized from the home of Lt. Vasken Gourdikian included 34 pistols, valued at about $27,900, 21 rifles or rifle receivers, valued at about $20,450, and two shotguns, valued at about $2,600. The cache of weapons represented a wide variety of guns, ranging from inexpensive and small-caliber pistols to pricey and powerful tactical rifles. Gourdikian formerly served as the police chief’s adjutant and department spokesperson. The lieutenant and the Pasadena Police Department have repeatedly declined to comment on the investigation. The head of the ATF’s Los Angeles-area field office issued an advisory to Southern California law enforcement agencies in late-March, caution of a growing trend of illegal weapons dealing by police officers. A man and woman were found shot in a stolen car in the parking lot of a Santa Fe Springs motel late Saturday, four hours after a shooting rampage that left one man dead and another wounded in Whittier and La Mirada, officials said. The man and woman wounded in the Santa Fe Springs shooting were being held on suspicion of auto theft and gun possession Sunday as detectives continued investigating whether they were connection to the earlier shooting spree, according to Whittier police and Los Angeles County sheriff’s officials. Their identities were not released. The couple matched the general description of the man and woman being sought in connection with the spate of shootings, Sgt. Vincent Plair of the sheriff’s Information Bureau said in a written statement. The suspect description has not been disclosed. “It is unclear whether the detained individuals are the suspects in the earlier shooting,” Plair said. “Homicide Bureau investigators are following up on all possible leads and working with Whittier Police Department to solve these crimes. “As of now there have not been any arrests made in connection with these incidents,” he said. Officers responded to reports of “shots fired” at 8 p.m. at the Budget Inn, 13420 Firestone Blvd., according to Whittier police Sgt. Ramos, who declined to give his first name. The circumstances of the shooting were unknown and no suspect description was available, Ramos said. Both the man and woman were taken to the University of Southern California, Irvine Medical Center for treatment, the sergeant said. The woman was shot once, he said. Her injuries were not believed to be life-threatening. The man suffered multiple gunshot wounds. An update on his condition was not available. Police soon learned that the car the man and woman were in had been reported stolen, Whittier police Lt. Brian Ellis said. Officers also recovered a gun from the couple. Without a suspect description, it was unclear whether the shooting was related to a spate of three shootings in Whittier and La Mirada Saturday afternoon that left one man dead and another man wounded. The violence began about 3 p.m. with a carjacking carried out by a man and woman in Pico Rivera, according to sheriff’s officials. The carjacked Nissan Pathfinder showed up at a Starbucks coffee shop at Whittier Boulevard and Colima Road in Whittier about 30 minutes later, Ellis said. The suspects opened fire on a man in his 50s in an alley to the rear of the coffee shop. He was wounded in the leg. Within minutes, the occupants of the SUV again opened fire at the intersection of Colima and Lambert roads, Ellis said. A car was struck, but the people inside were unhurt. A third shooting believed to involve the same carjacked SUV and suspects unfolded about 4 p.m. at Santa Gertrudes Avenue and Alicante Road in La Mirada, sheriff’s officials said. The victim, 44-year-old Jose Shagun of Norwalk, succumbed to his injuries at the University of California Medical Center, Irvine, at 4:51 p.m., according to Orange County coroner’s records. Deputies found the Nissan SUV believed to have been used in the three shootings shortly after 6 p.m., abandoned at Amelia Mayberry Park in South Whittier. One man died and several other people were wounded in a string of shootings in the Whittier, La Mirada and Norwalk areas on Saturday afternoon which were believed to linked to the same carjacked car, authorities said. The attacks took place beginning about 3:30 p.m. in the jurisdictions of the Whittier Police Department and the Los Angeles County Sheriff’s Norwalk Station, according to Whittier police and Los Angeles County sheriff’s officials. A man died at a hospital following one of the shootings in La Mirada, officials said. The series of crimes was believed to have begun with the carjacking of a dark green or black Nissan Pathfinder SUV in the Pico Rivera area about 3 p.m., officials said. The vehicle was occupied by a man and a woman, both armed with guns, when it pulled through the rear alley of a Starbucks coffee shop at Whittier Boulevard and Colima Road about 3:30 p.m., Whittier police Lt. Brian Ellis said. A man in his 50s was walking in the alley. “The suspects pulled up to him and shot him in the leg,” Ellis said. The victim was treated for injuries not believed to be life threatening. There was no apparent motive for the attack, which appeared to be random, he said. The SUV then headed south on Colima Road, where the attackers opened fire on another car at Colima Road and Lambert Road, according to Ellis. The victim’s car was struck, but no one inside was injured. The SUV was last seen heading west on Lambert Road following the car-to-car shooting. The same SUV is believed to be linked to a fatal shooting about 30 minutes later in La Mirada, Deputy Ryan Rouzan of the sheriff’s Information Bureau said. A man was shot and mortally wounded about 4 p.m. at Santa Gertrudes Avenue and Alicante Road, sheriff’s officials said in a written statement. “The victim was transported to a local hospital where he was pronounced dead,” according to the statement. Deputies were also looking into possible additional shootings. Deputies found the SUV believed to have been used in the shootings parked, unoccupied, at Mayberry Park in South Whittier shortly after 6 p.m., officials said. But the suspects remained at large. The spate of violence followed another shooting in unincorporated South Whittier early Saturday afternoon in which a man was wounded. A man was shot in the leg about 12:45 p.m. along Carmenita Road, just north of Telegraph Road, sheriff’s Sgt. Jose Nevarez said. It was unclear whether the earlier afternoon shooting had any connection to the spate of shootings that occurred later in the afternoon. WEST COVINA >> A 19-year-old La Puente man is accused of murder following an alleged DUI-related crash that claimed the life of one passenger and injured two others early Saturday, police said. The crash took place about 3:50 a.m. on Lark Ellen Avenue, near Vine Avenue, West Covina police Lt. Ron Allen said. 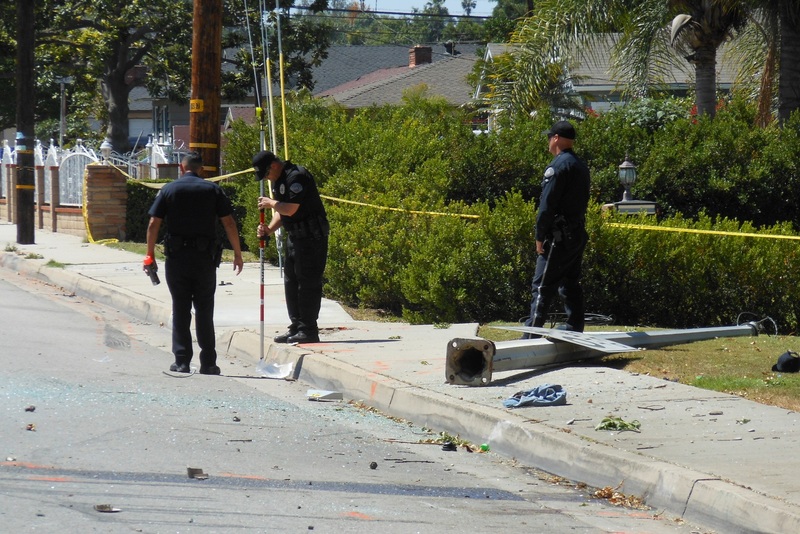 Andrew James Gomez was at the wheel of a Chevrolet Cobalt when it veered off the roadway and struck a light pole along the west side of Lark Ellen Avenue, according to West Covina police officials and Los Angeles County booking records. Two additional passengers in the car were treated for minor injuries, Allen said. Officials withheld the identity of the victim who died pending notification of his family, Los Angeles County Department of Medical Examiner-Coroner Lt. David Smith said. He was initially described only as a man. Gomez was treated for his injuries before being booked on suspicion of murder, according to the lieutenant. Investigators determined he was under the influence of a substance. Further details were not available regarding what substance or substances were believed to be in his system. The circumstances of the crash remain under investigation by West Covina Police Department’ Traffic Unit. According to county booking records, Gomez was being held in lieu of $1 million bail the West Covina Police Department’s jail pending his initial court appearance. Anyone with information can reach the traffic unit at 626-939-8555. SOUTH WHITTIER >> A man suffered a gunshot wound to his leg in a drive-by attack in South Whittier on Saturday afternoon, authorities said. The shooting took place about 12:45 p.m. in the rear alley of an apartment copmlex in the 10000 block of Carmentia Road, between Telegraph Road and Laurel Avenue, in the unincorporated county area, Los Angeles County sheriff’s Sgt. Jose Navarez said. Deputies responded to several 911 calls reporting a drive-by shooting and encountered the victim, described only as a man, wounded in the leg, the sergeant said. He was taken to a hospital for treatment and was expected to recover. His attackers were described as two to three Latino men in a small, white car, Nevarez said. The wounded man did not appear to be cooperating with investigators, he said. The motive was unclear, and no further details were available. Anyone with information can reach the sheriff’s Norwalk Station at 562-863-8711. Tips may also be submitted anonymously online to L.A. Regional Crime Stoppers at 800-222-8477. DUARTE >> A car-to-car shooting in an unincorporated county area near Duarte on Friday afternoon left one vehicle riddled with bullets, but no injuries were reported, officials said. The shooting took place about 3:45 p.m. in the area of California Avenue and Camino Real Street, Los Angeles County sheriff’s Sgt. Erick Martinez said. Two people were inside the car that was struck with a volley of gunfire, but both escaped injury. The shooter was believed to be a lone man in an older model, silver, four-door Nissan Sentra he said. The car was last seen heading west on Camino Real. Sheriff’s gang detectives were handling the investigation into the attack. Monrovia, Duarte and the unincorporated county area that separates them have seen at least 10 shootings since January, leaving four victims dead and five more wounded. Anyone with information can reach the sheriff’s Temple Station at 626-285-7171. Tips may also be submitted anonymously online to L.A. Regional Crime Stoppers at 800-222-8477. ROWLAND HEIGHTS >> Detectives are investigating the disappearance of an 18-year-old Rowland Heights woman who vanished under suspicious circumstances while on her way to school early Friday before being , authorities said. Cristal Flores left her home Friday morning en route for Rowland High School, 2000 S. Otterbein Ave., Los Angeles County sheriff’s Lt. David Buckner said. But she never arrived. Friends notified the girl’s family shortly before 8 a.m. that Flores had called them and made alarming statements. The exact phrasing was not clear, but Flores was believed to have said something about being followed by a possibly armed person or people, according to the lieutenant. Her location at the time of the phone calls was unknown. Loved ones circulated fliers with Flores’ photo on Friday, both in the community and online. Flores was found safe late Friday night, sheriff’s officials said. No further information was available Saturday as detectives from the sheriff’s Major Crimes Bureau continued their investigation. Anyone with information can reach the sheriff’s Walnut-Diamond Bar Station at 626-913-1715. Tips may also be submitted anonymously to L.A. Regional Crime Stoppers at 800-222-8477. DIAMOND BAR >> A woman was hospitalized after she ended up pinned between a car and a garage door while teaching her teenage son to drive in residential neighborhood in Diamond Bar late Thursday, officials said. The accident took place about 8:50 p.m. in the 1100 block of Cleghorn Drive, Los Angeles County sheriff’s Lt. David Buckner said. The woman was giving her teenage child driving lessons when the car lurched forward inside their garage, pinning the woman between the vehicle and the wall, the lieutenant said. “She as pinned for a while between the car and the garage structure,” he said. Paramedics treated the woman at the scene and took her to a hospital. She suffered injuries that possibly included broken ribs, but were not believed to be life-threatening, according to Buckner. The young student driver was extremely distraught, but unhurt, Buckner said.